Take things to the next level by adding some extra bass. If you’re like me and you’ve rocked a sound bar as the primary audio source of your home entertainment system for a solid stretch of time, you might think that’s all you need. But since adding a subwoofer to my system, I’ve learned better. In fact, I’ve come to the conclusion that no home entertainment center is complete without it. Even if the basic sound bar you’re currently using came with a built-in subwoofer, it’s okay to want more bass. After all, only a subwoofer gives you the low end you need when a T-Rex stomps around in Jurassic Park. Only a sub provides the rumbling bass that completes any battle scene in Game of Thrones. And if you’re a music lover into hip-hop, EDM, heavy metal or other bass-heavy genres, a subwoofer will not only become your all-time favorite audio component ever, it will make your friends want to visit more often. Have you ever come home after seeing an action movie at your local theater and wished your system could reproduce the bone-shaking rumble you felt during the big finale? It can, once you add a subwoofer, which is able to recreate the low bass signals that you can’t get with just a sound bar. While not quite as powerful as the monster speakers they use in theaters, the Yamaha NS-SW100 powered subwoofer helps recreate the cinematic feeling you get in a traditional movie theater by incorporating innovative technologies like a Twisted Flare Port that maximizes the low-end thump coming from its 10″ woofer. We all know the struggle with placing furniture in a small living room or den. 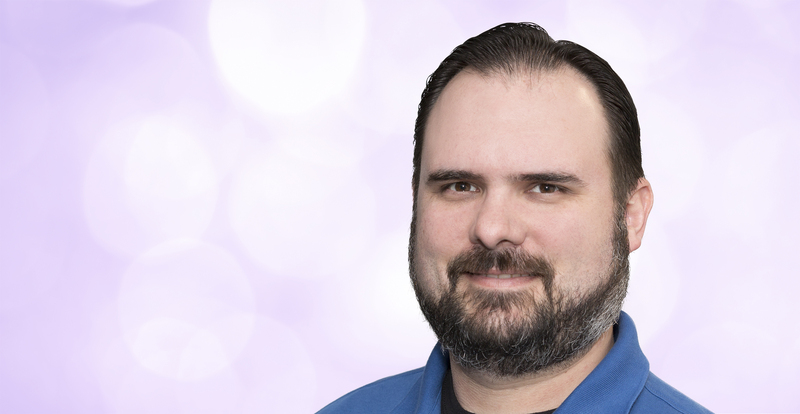 But because low frequency sounds are largely omnidirectional (that is, for the most part you can’t tell exactly where they’re coming from), there are always lots of options when it comes to the placement of a subwoofer. To both maximize the audio experience and take up the least amount of space, many people opt to place their subwoofer on the floor, right next to their entertainment center, with the sound bar directly underneath the TV (mounted or on the cabinet itself). The Yamaha NS-SW210 is a bit taller than the NS-SW100 but half as deep, allowing it to be tucked nicely next to your entertainment cabinet. 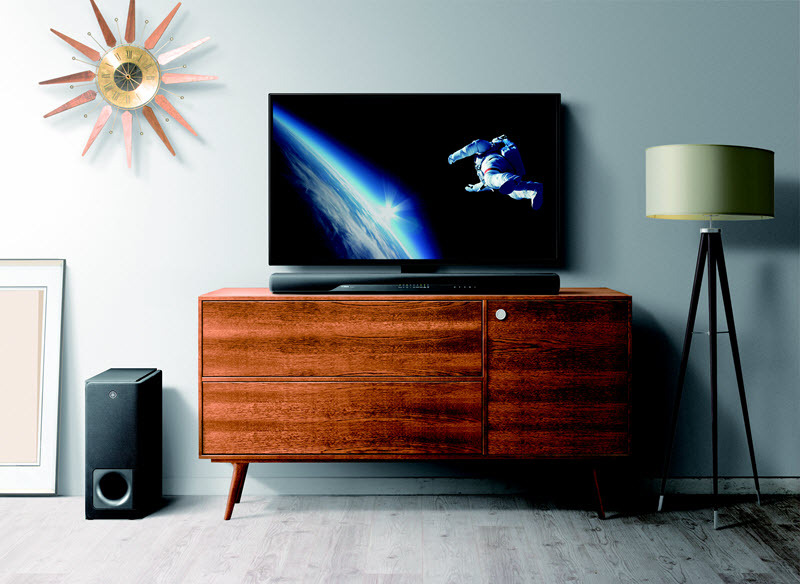 If you have a space issue and are interested in upgrading from an older model sound bar to a new one, consider the Yamaha YAS-207, which comes with a wireless subwoofer and gives you plenty of power in a slim design. For those looking to upgrade to a new sound bar and subwoofer combo, the YAS-207 is a solid option. Its appearance as a simple black box below your line of sight, placed in a spot that doesn’t typically get a lot of eyes on it, allows pretty much any subwoofer to blend in well with virtually any home environment. You’ll find that there are plenty of options out there to choose from, including the uniquely shaped Yamaha YST-FSW150, which can be mounted horizontally or vertically. Ready to go out and buy a new subwoofer? Great! But first you’ll want to make sure it’s compatible with your sound bar. You can do this easily by checking the back of your sound bar. If it has a subwoofer output jack, it will work perfectly with any powered subwoofer. All individually sold Yamaha sound bars are compatible with this function, including the YAS-107, YSP-5600 and ATS-1070. Check the rear of your sound bar to ensure there is a compatible subwoofer output to pair with the subwoofer’s input, as seen here on the back of the Yamaha YAS-107. Enjoy that extra low end! 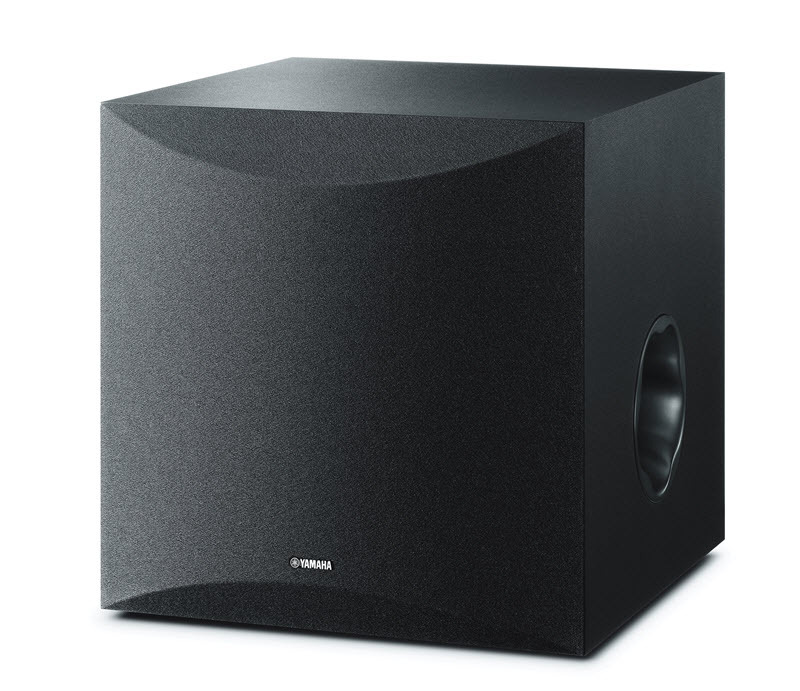 Click here for more information about Yamaha subwoofers.